There was a time in my life when I thought I knew a thing or two — about life, about being a reasonably functional member of society, about language, about being a food editor. That phase of my existence ended several weeks ago when the meatloaf salad showed up in my workplace cafeteria. Seeing as I’m a journalist and all, I took it upon myself to investigate. 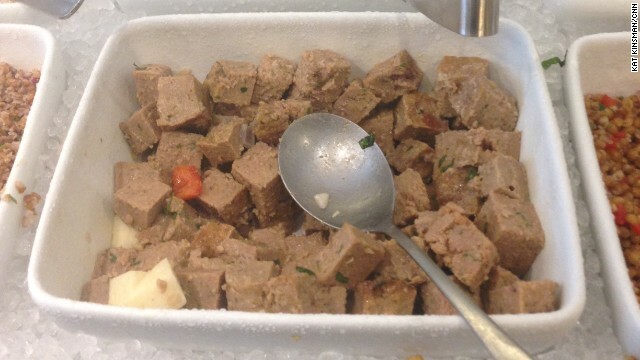 The dish was indeed on the salad bar, labeled “meatloaf salad” at 50 cents an ounce, and it tasted like cold chunks of decently prepared meatloaf. I posted a picture online and promptly questioned everything I have come to understand about myself and what I know about the world. Stuff mixed with lettuce, I get that. Various materials held together with mayonnaise, I understand. Fruitstuffs tumbled about with marshmallows and cream, I don’t so much dig, but it has been codified as salad for me in the past, so I accept it as such. This entry was posted in CNN, Food History, Writing on August 23, 2014 by Kat Kinsman. This entry was posted in Hi Anxiety, HLN, TV on August 16, 2014 by Kat Kinsman.